Captain J. Flint is a fictional 18th-century pirate who features in a number of novels and films. Created by Scottish writer Robert Louis Stevenson (1850-1894), Flint first appears in a children's magazine in 1881 and later in the classic adventure yarn Treasure Island (1883). In Stevenson's book, Flint, whose first name is not given, was the captain of a pirate ship, The Walrus, which accumulated an enormous amount of captured treasure, approximately £700,000. Flint and six members of his crew bury the plunder on an island located somewhere in the Caribbean Sea. Flint then murders his six assistants, leaving the corpse of one, Allardyce, with its arms outstretched in the direction of the buried treasure. 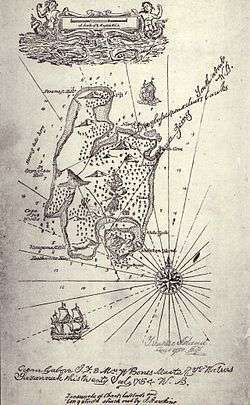 The location of the treasure is marked by Flint on a map and entrusted to his first mate William "Billy" Bones. It later falls into the hands of the protagonist of the novel, Jim Hawkins. The only person Flint was said to fear was his quartermaster John Silver, who later even called his parrot "Captain Flint" in mockery. 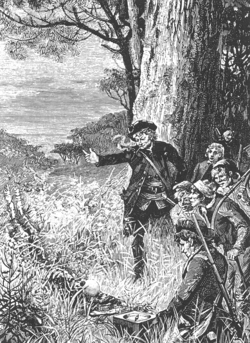 Flint is said to have died in Savannah, shouting, "Darby M'Graw - fetch aft the rum...." His death was said in the book to have been caused by the effects of rum. The inscription on the map suggests that he died in 1754. Flint has a major part in the 1924 prequel Porto Bello Gold, by A. D. Howden Smith, which depicts the way that the treasure was captured from a Spanish galleon. In this version, Flint is described as having started his piratical career as the junior partner of Andrew Murray, an idealistic Jacobite turned pirate, who is not referenced in Stevenson's original book. Flint gradually becomes the dominant partner. The book describes how Flint secretly buries the treasure which would be recovered a generation later by the protagonists of Treasure Island. John Drake's prequels: Flint and Silver (2008), Pieces of Eight (2009) and Skull and Bones (2010), all heavily feature Captain Flint and reveal his Christian name to be Joseph. Flint is mentioned in the novel Peter and Wendy by J. M. Barrie, a friend of Stevenson. The first mention is in a passage introducing Captain Hook's pirate crew: "Here is Bill Jukes, every inch of him tattooed, the same Bill Jukes who got six dozen on the WALRUS from Flint before he would drop the bag of moidores." The second mention is as Hook is attempting to intimidate the Darling children and the Lost Boys, but is heckled by his inner demons: "'I am the only man whom Barbecue feared,' he urged, 'and Flint feared Barbecue.' 'Barbecue, Flint—what house?' came the cutting retort." In Arthur Ransome's book Swallows and Amazons, the Blacketts' uncle James Turner is nicknamed Captain Flint by the Swallows. This is because they believed that he looked like a retired pirate and took the name from Treasure Island. He is nearly always referred to by this name in the rest of the books. In the movie Muppet Treasure Island, a loose adaptation of the Stevenson story, Captain Flint is shown at the opening burying the said treasure and thereafter killing all the crew who bury it for him. He then returns to sea and gives his map of the place to Billy Bones, who takes it with him. Flint has fifteen crew members to dig the treasure pit in this version, not six, so there is a difference. Also, the treasure itself is guineas and pieces of eight. Captain Flint was shown briefly in the animated feature film Treasure Planet by Disney. In this film, the character was known as Nathaniel Flint, a space pirate of non-human origins whose reputation was legendary for leading his ship and his crew to plundering merchant ships, infamously appearing and disappearing without a trace, and eventually burying his treasure (called by many "Flint's Trove" and/or "the loot of a thousand worlds") inside the giant alien mechanism known as Treasure Planet. Set roughly two decades before the events of Treasure Island, the 2014 televised series Black Sails follows the adventures of Captain Flint and his pirate crew. His first name is revealed to be James in the episode "VI." Episodes "IX" and "XIII" further reveal that he is a disgraced former Royal Navy lieutenant named James McGraw, dismissed from the service and exiled from England for having an affair with Lord Thomas Hamilton, the son of Lord Alfred Hamilton, lord proprietor of the Bahama Islands. He adopted the name "Flint" after a mysterious man who boarded his grandfather's ship while at anchor and then disappeared. He is portrayed by Toby Stephens. ↑ "Flint and Silver by John Drake". Harper Collins (Australia). 2013. Retrieved 9 September 2013. ↑ "Barrie, Hook, and Peter Pan: Studies in Contemporary Myth; Estudios sobre un ...". Books.google.ca. 2012-11-15. p. 74. Retrieved 2016-06-14.